Many of the climbs are quite technically difficult and require a degree of competence and fitness so should only be attempted by confident climbers. Areas include Bavella and the Alta Rocca mountain range. Climbing around Zonza, the cliffs of the Alta Rocca mountains and the needles of Bavella. Advanced climbing for the experienced (level 5+) on the needles of Bavella. Tours for up to 5 people lasting from 15 to 70 minutes leaving from Porto Vecchio or Ajaccio. 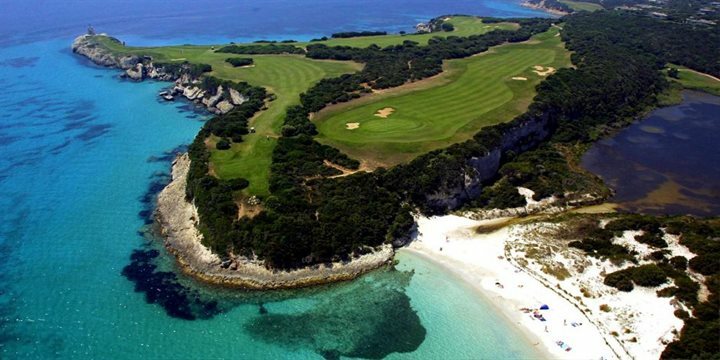 If you have a passion for golf then you must visit the spectacular Golf de Sperone, located on a breathtaking site at the southern tip of Corsica overlooking the Mediterranean, the Bonifacio Straits and the tiny islands of Cavallo and Lavezzi. A mini golf course in a lovely setting. Closed during the hot period of the day. There are a limited number of tennis clubs in the area. For those with enough determination and stamina, the views from some of the coastal roads and mountain tracks are breathtaking. Because of the rough terrain, mountain bikes (vélos tous terrains or VTTs) are preferable over other types of bicycles and can be hired in Porto Vecchio. The best time for cycling is during mid-season: May - June and September - October, when the weather is slightly cooler and the roads quieter. To escape the traffic completely there are numerous footpaths, woodland trails and 1,900 kilometres of bridleways which will enable you to discover more of the island's natural beauty, the best of which are near Forêt de l'Ospédale, Bavella and the Coscione Plateau in the south. The Mare e Monti Sud hiking path which runs between Propriano and Porticcio is one of the island's best opportunities for cycling as are the tracks of coastal Sartenais. Bike rentals from €15pd. Can be delivered to your property on request. 15 trails in the bavella mountains for mountain biking, endurance and cross-country cycling. From €50pd including bike rental and equipment. For those who prefer to have more than just pedal power, quad biking through the maquis may be a better choice.The following all arrange accompanied trails on quad bikes. Circuits from 10 mins up to 5 hours. They also do evening trips on a Wednesday. As well as organised tours you can also just rent bikes. Small ponies and treks for children from 3 years old are also available. Organised walks in the maquis, in the river or on the beaches on horses or ponies. Offer pony and horse rides on the beach. From €24 for an hour to €60 for half day.